…whatever the girl is wondering about. Usually I’ve done a brief celebratory blogpost whenever a new story or essay comes out, but I’ve been remiss of late. I’m behind by several stories. My story “Griefbunny” came out in Apex Magazine back in December, when I was in NY visiting with James’ relatives and on the computer less than usual. Apex has published some of my very favorite stories over the years (Genevieve Valentine’s “Armless Maidens of the American West” comes to mind) and was helmed by one of my all-time favorite authors (Cat Valente) for several years. It also received a very kind write-up in Tangent. Good work, little story! 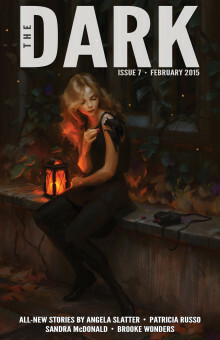 My Writers of the Future finalist story, “A Spoke in Fortune’s Wheel” *finally * found a home, after much revision, at The Dark Magazine, a relatively new and very shiny dark fantasy and horror market. All the stories in the issue are worth checking out, and their archive is splendid and growing: I particularly liked Helena Bell‘s flashfic. Finally, I have work forthcoming (soon! so soon!) in DIAGRAM. This is perhaps the best single work I’ve ever written (IMO), and I didn’t actually write it: it’s an erasure piece about the suicide of my boyfriend back in 2005. It was the cornerstone of my dissertation defense, helped me get into Breadloaf, and was part of the job talk that led to my position at UNI. One of my new colleagues, Rachel Morgan, has a gorgeous prose poem in an earlier issue, alongside the omnipresent James Franco (!). I’m a little sad we weren’t in the issue together…me and Rachel, not me and James (Franco, not Brady). Anyway, DIAGRAM is the best thing going for experimental nonfiction, and I’m ecstatic to appear on their site. I’m still loving life in Iowa, still battling bizarre and unnecessary arm-wrist-shoulder pain/numbness, still fighting for a pain-free writing/exercise routine. After three years of trying everything from medication to physical therapy (and on and on), I’m starting to wonder if pain management is the best I can manage, if “pain-free” isn’t in my future. I plan to write anyway. ← Everything all at once.